The newest addition to the Dr.Andrew Weil for Origins line up is Mega-Bright Dark Circle Minimizer which is a great post party season treat for the eye as it not only visibly reduces under eye circles but also firms and protects the delicate under eye skin too. Like most I have an interest to what is is actually in a product rather than simply reading what a product promises to offer. 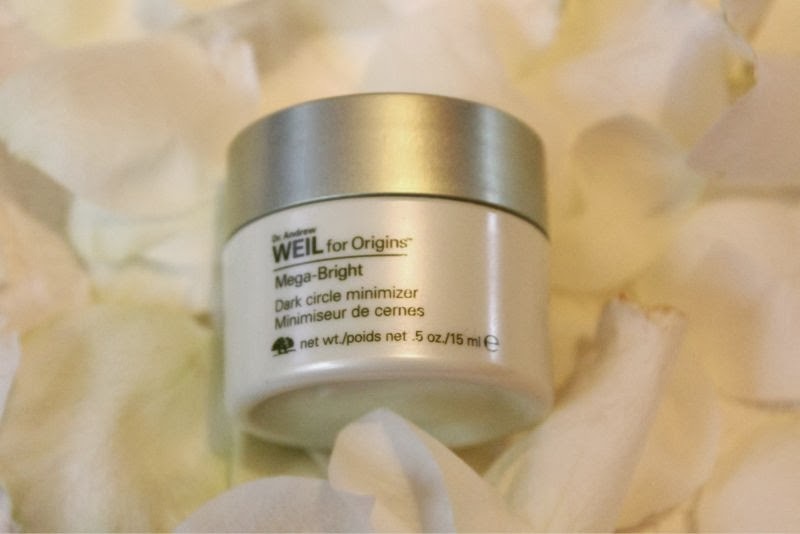 As the main aim of the Dr.Andrew Weil for Origins Mega-Bright Dark Circle Minimizer is to brighten and rid the skin of dark circles it unsurprisingly contains a Vitamin C enriched ingredient in the form of Rosa Roxburghii (often used to fade brown spots so it can help reduce discolouration of the skin in any form). This is an extract from the chestnut rose which is rich in antioxidants and oddly fragrance free making it perfect for the eye area. It also included. To help natural fight dark circles and discolouration Japanese Ume has been added this is a natural antibiotic and protects against free radical damage and may slow down ageing process. Lastly we have Molasses (again for discolouration) that contains natural peptides to help rebuild the skin structure which again can help ward off the signs of ageing. 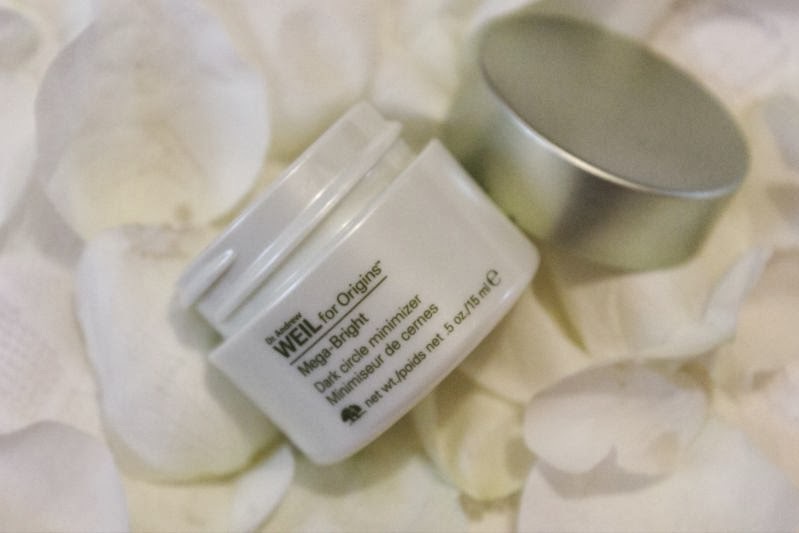 All that is fine and dandy but does Dr.Andrew Weil for Origins Mega-Bright Dark Circle Minimizer work? In a word yes! In my opinion this is a fairly nourishing and to some degree rich eye cream making it perfect for dry eye skin or as an intense evening eye cream, however you can use it in the morning before make-up application and other than adding a light radiant glow to the skin it will not alter any make-up applied on top. 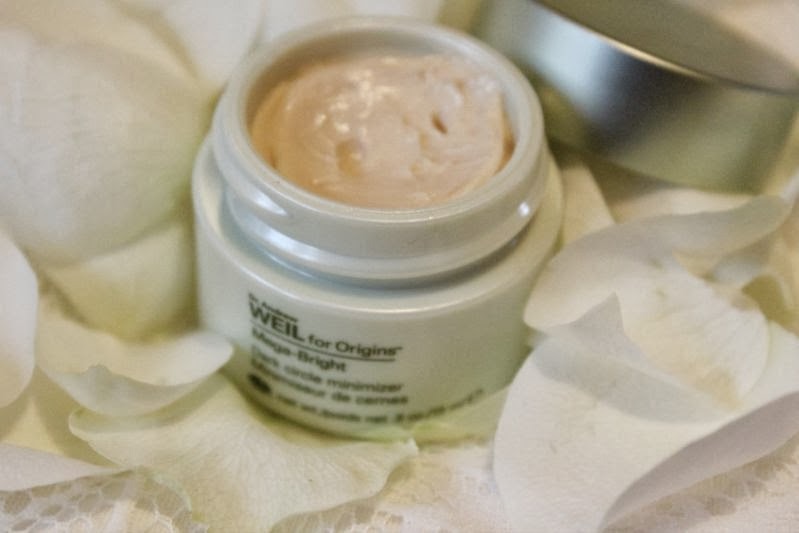 The texture of Dr.Andrew Weil for Origins Mega-Bright Dark Circle Minimizer is somewhere in the middle of your typical cream offering and a gel formula - a little goes a long, long way but it is quickly absorbed into the skin using patting motions. To reap any rewards in terms of reducing dark circles you will have to use it at least once a day for around a month - I didn't see any real difference until the three week mark. However it does moisturise and leave the skin luminous from the first use. I will admit that at £32 for 15ml it is fairly pricey but as you can see from my jar after a months use (once a night) that it will last for quite a while which can help justify the price.